Asbestos awareness training helps those working in contact or associated with asbestos, by providing an understanding of the risks associated with it. The training also covers the dangers of working with asbestos and also helps employers comply with the law by ensuring their workers are appropriately trained, in order to work safely. Asbestos. You may of heard of it. Long ago it was once referred to as a ‘magic mineral’ – yet it is now known as a dangerous substance which can cause serious health implications. Asbestos is a term for a group of minerals made up of microscopic fibers. Before its dangers were discovered asbestos was used for installations in buildings, flooring and roofing – it was also sprayed on ceilings and walls. However due to the various and significant health implications asbestos can cause when exposed, it is banned in the UK. How Can Asbestos Be Dangerous? Asbestos can only be dangerous when fibers enter the body via breathing. Materials containing asbestos are not generally considered to be harmful unless it is releasing dust or fibers into the air where they can be inhaled or ingested. If asbestos fibers are trapped into the body, it is the fibers which can cause health problems. Why Is It Important To Take Asbestos Awareness Training? 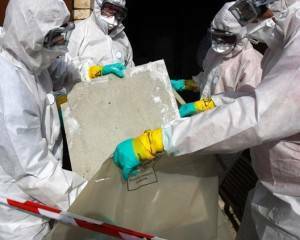 Asbestos kills approximately 4,000 people annually, yet this number is increasing therefore it is quite useful to take the training required. The Asbestos Awareness Training course is designed to ensure delegates recognise the dangers of asbestos and are aware of the regulations associated with and directly connected to asbestos. Delegates will be taught the control of Asbestos Regulations, along with the Health and Safety at Work Act 1974. Asbestos Training is a legal requirement. If you are working on a building which was built prior to the year 2000, asbestos could be present, hence it is essential you’re aware of the necessary information to keep yourself and others safe. Here at Project Skills Solutions, we run a half day training course on asbestos awareness, aimed for anyone working in an environment where they may encounter with asbestos. If you’re working with any of these, which involves asbestos – it will be quite important to undergo an asbestos awareness training course. In fact most local authorities will require some formal training in order to work for them.